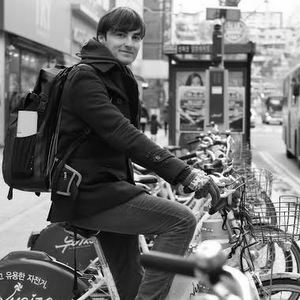 On the Seoul Floating Islands, Colin talks with Nikola Medimorec, co-author of Kojects, an English-language blog on transport, urban planning, and development projects around Korea. They discuss the first Korean city he ever experienced, and what introduction it gave him to both the country’s festival culture and its development culture; what makes the transit different in Asia than in elsewhere; the installation he witnessed of glass panels on the subway platforms, and how that not just prevents suicides but improves the riding experience; the question that got him studying geography in the first place; the success of his posts on KTX stations he wrote in his first, German-language blog, and how that led to Kojects; why he most enjoys writing about Korean bicycle infrastructure, now that it has become possible to bike there; the difference between cycling in Korea and cycling in Germany, where he grew up; how old Korean men all listen to the radio on their bicycles; how he plunged right into his studies at Seoul National University, including a statistics class in Korean; how the Suwon EcoMobility Festival took over his life; the cities that most fascinate him outside of Seoul; his impressions of the new-built “city from scratch” of Songdo and the Dongdaemun Design Plaza, “an alien spaceship landed in the middle of Seoul”; the current Seoul mayor’s aversion to all big projects, especially the “ugly” DDP; the ongoing controversy of the Cheonggyecheon Stream; whether a project like the Yonsei-ro Transit Mall can allow for commerce on the street (and especially street food); his initial surprise at all the people on the streets in Seoul, and the changing reasons they’ve come out to the streets; where to look for a pojangmacha, and why having to search for them is a problem in itself; the domestic culture of Germany versus the urban culture of Korea; what impresses German friends when the come visit Korea; what Korean cities could learn from European ones; whether Korea has any more large-scale projects remaining in the future; how older European buildings have become favored, while even 25-year-old buildings in Korea have badly deteriorated and await redevelopment; what the new “phallus symbol” of the Lotte World Tower (in which he once saw a fire) demonstrates, and why he doesn’t care about that kind of skyscraper; whether Korean 빠리 빠리 culture results in a shoddy built environment; why he couldn’t do a Kojects-style blog in Germany; Kojects’ reliance on Korean sources, and how that separates it from other English-language sites observing Korean cities; how much of his mastery of Korean comes directly from reading about transport and urban development; his preferred methods for first exploring a city; what you notice when you walk in Seoul; and the story behind the Seoul Floating Islands on which they sit. This was written by Colin Marshall. Posted on Wednesday, December 31, 2014, at 10:35 am. Filed under Korea, Notebook on Cities and Culture, Seoul. Bookmark the permalink. Follow comments here with the RSS feed. Post a comment or leave a trackback.